This summer LitWorld is running a Video for Change Workshop series at the Polo Grounds Community Center in Harlem. The goal is that our 8 teen students will each produce a short documentary about their lives. All of the teenagers have so many interesting stories to tell and we at LitWorld are excited to show the films at the premier screening on August 4th! The students have developed their ideas, learned about framing, sound and interviewing. They have all started to film now, and next week the editing phase starts. Shawn is making a film about playing basketball, which is his passion. Yasmine is adopted and is creating a film about what it is like to be adopted and live with her adopted sisters and brothers. 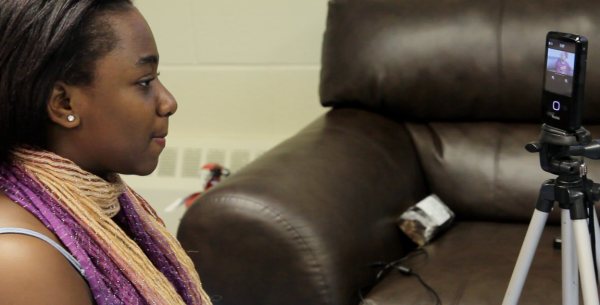 Daija loves music and is interviewing several local musicians about what music means to them. Workshop Leader Anni Lyngskaer assists Daija in setting up the camera for her interview. Daija films her interview with the muscian Gabriel.